GOLF: The Pico Rivera Municipal Golf Course offers low-cost golf lessons to kids from 6-17 years. Click here for more information. CHAMPION YOUTH OUTREACH: This non-profit organization offers various sports & recreation programs for kids ages 4-15 in city parks & church meeting rooms in Montebello, Pico Rivera, Monterey Park, East Los Angeles, Alhambra, and other cities in our area. Click here for more information. 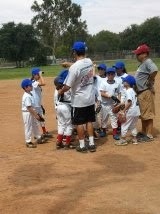 BASKETBALL, SOCCER, T-Ball/SOFTBALL: The Montebello-Commerce YMCA offers seasonal sports programs for kids ages 3-13. Basketball in the spring, t-ball/softball in the summer, and soccer in the fall. Registration starts at $60 for YMCA members and $135 for non-members. $25 uniform fee. Registration includes trophy. No extra fundraising or costs are involved. For more information: Montebello YMCA, 2000 W. Beverly Blvd, Montebello, or call at 323-887-9622. BASKETBALL, SOCCER, FLAG FOOTBALL: The city of Montebello offers youth sports for kids ages 5-15. Basketball in the spring, soccer in the summer, and football in the fall. Registration is $40. No extra fundraising or costs are involved. For more information visit the Cathy Hensel Youth Center, 236 George Hensel Drive, Montebello, or call 323-887-4570. BASKETBALL: The Montebello Police Athletic & Activities League hosts seasonal sports programs. Click here for more information. SPLASHBALL: The YMCA offers a junior water polo program for kids ages 5-9, and a pre-water polo team for older kids. Click here for more information. SWIMMING: The Montebello-Commerce YMCA offers swim lessons, a junior lifeguard program, and a swim club. Sessions run by the month and average out to $5 per lesson for YMCA members and $10 per lesson for non-members. Click here for more information. SWIMMING: The city of Montebello offers summer swim lessons. Parents must register in person at the Montebello Parks & Recreation department. Classes fill up quickly, many parents get up very early on registration day to ensure their children are enrolled. For more information contact the Montebello Parks & Receation Department at 323-887-4540. 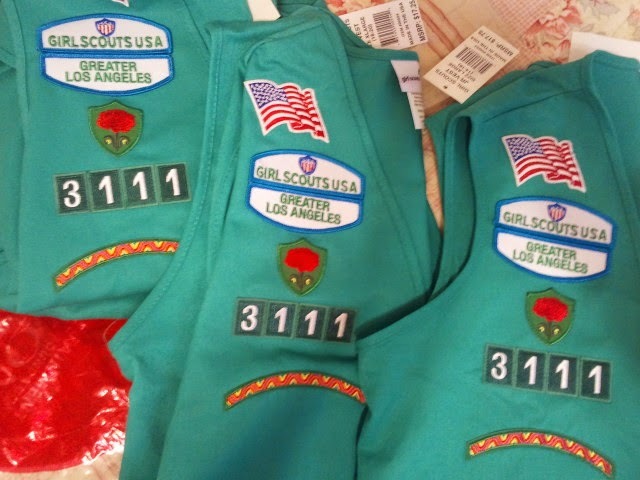 GIRL SCOUTS: Troop 3111 meets the first Sunday of the month at 8:30am at Our Lady of Miraculous Medal Church, 820 N. Garfield Avenue, Montebello from September-June. Girls in Kindergarten through 3rd grade are welcome to join. CUB SCOUTS & BOY SCOUTS: Cub Scout Pack 890 & Boy Scout Troop 330 meet at the Montebello Scout Hut at the north end of the driving range at the Montebello Golf Course. Boys in first through fifth grade can to join Cub Scout Pack 890, meetings are Thursdays at 6:30pm. Boys in sixth grade through high school can join Boy Scout Troop 330, meetings are Tuesdays at 7pm. Cub Scout Pack 476 welcomes boys in first-fifth grade, meetings are Thursdays at 7pm. Boy Scout Troop 476 welcomes boys in sixth grade through high school, meetings are Tuesdays at 7pm. Both packs meet at St. Benedict Scout Hut at 1022 W. Cleveland Avenue, Montebello. The city offers copies of this flyer at the Parks & Recreation Department. hey! 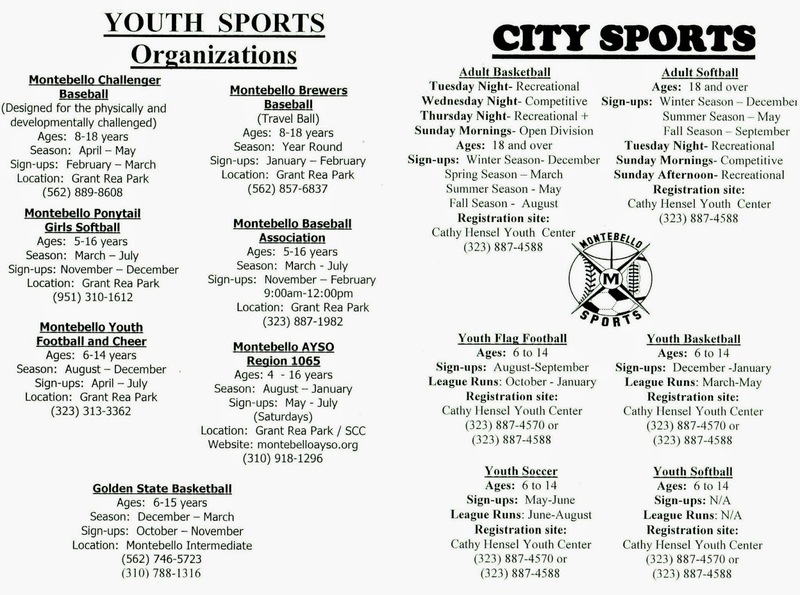 check out the city of montebello's sports programs. i didnt even know these existed. $40! and looks pretty good, we signed up for basketball league, talk to david at city gym, he will get you some good info. Did you know that the fees for swimming lessons have increased doubled from last year? I'm very disappointed. I saw that it's now $34 for a week of lessons. I didn't know the price before, just that parents thought it was a bargain. I'm sorry to hear about the increase.